When it comes to Russia, Pittsburgh’s population comes from former Soviet satellites, a small enclave of immigrants and, of course, the Penguins’ Evgeni Malkin. What our city lacks is a plethora of Russian restaurants to offer Pittsburghers a taste of that country’s cuisine. Mount Washington is home to one such place. Kavsar, an Uzbek and Russian restaurant, provides a small window into those flavors for folks intrigued by dishes likely available to soccer fans in Russia for the World Cup. Owners Hayrullo Umaraliev and Tahmina Umaralieva hail from Uzbekistan, although Umaralieva is also half-Russian. Around four years ago, Umaraliev opened Kavsar as a gift to his wife, who is the restaurant’s chef. Even through a translator, his affection for her and belief in her talent are clear — and it all plays a significant role in this restaurant’s culture. In Uzbekistan, a country of about 32 million people, culture and food remain closely tied with Russia. A major difference is that much of Uzbekistan’s population is Muslim and so the food is often halal and does not include pork. 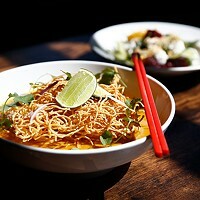 Kavsar’s menu is entirely halal, although dishes are very meat-forward. 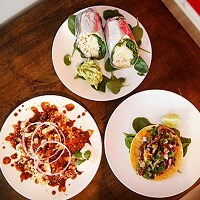 Beef, lamb and chicken are in most menu items, which span from simple salads and soups to large portions of homemade dumplings, rice and pasta dishes. Plov, a traditional Uzbek rice dish with lamb, carrot, chickpeas and spices, is a popular dish among customers seeking authenticity. Venera, a server at the restaurant, insists the manti (a kind of savory beef dumpling) reminds her of being home in Uzbekistan. 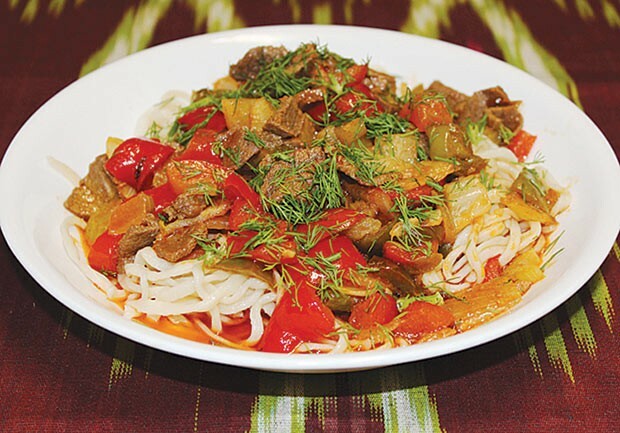 Lagman, a homemade and brothy noodle dish with beef, red and green peppers and topped with dill, shines as a convergence of cultures and trade in Tashket, the capital city of Uzbekistan that was once along the Silk Road. The Umaralievs hold that Uzbek cuisine is very popular in Russia, with a few of the most expensive restaurants in Moscow serving Uzbek cuisine. Umaraliev acknowledges each culture thinks of the other’s as its own, but with a few discernible differences. “No one can cook rice like the Uzbeks,” says Umaraliev with a smile.